In the old days in a village, there were two neighbors. 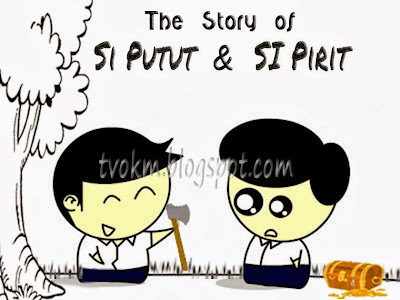 Their names is were Pirit and Putut. They were good friends and never fight fought. One day, Pirit went to cut the wood at the edge of a river. While he was cutting wood, his axe fell into a deep river. Pirit only had one axe and that axe was the one he really loved. He took off his shirt and jumped into the river. As he went, the view he saw became brighter. Suddenly, he stepped onto dry land. He then looked around the place and he saw an old woman standing in front of him. The old woman looked at him. "Son, what are you looking for?" the old woman asked. Don't worry, I came here to find my axe that fell while I was cutting wood just now," Pirit replied. "Oh then," said the old woman. "All of the axes are there," she continued while pointing her finger, "Choose which one yours." Pirit headed to the place specified by the old woman. It was exactly how the old woman described it. There were some axes. There were axes made of gold, silver, and iron, but Pirit's axe was not there. Pirit told the old woman that his axe was not there. The old woman turned around and grabbed something. When Pirit saw what she held, he headed towards the old woman and said, "That is my axe." The old woman gave the axe to Pirit. Pirit was very happy and said, "Thank you! Now I can cut wood and clean my garden." "Okay. When you return, pick two gourd flower stalks and place them in the river where you dived earlier. Place these flower stalks on both the upstream and the downstream sides. When both are in place, dive between two flowers," the old woman replied. Then, Pirit continued his journey until he arrived at the place he cuts the wood. He then followed the advice of the old woman and prepared everything. When he returned, he was surprised to see a box in front of him. He opened the box. "Wow!" he shouted after the box was open. In the box, there was gold, money and silver. He then lifted the box and returned home. On the way home, he met with Putut. Putut was surprised when he saw Pirit holding a box. What are you carrying, Pirit?" he asked. Pirit told Putut that he was lifting gold. He began to tell the events he experienced with the old woman earlier. Unfortunately, before he could finish his story, Putut ran off. Putut went to the area where Pirit was cutting wood earlier and had accidentally dropped his axe into the river. Then, he jumped and dived. Like Pirit, Putut met the old woman. The old woman also asked Putut why he was here. Putut said that his axe had fallen. The old woman asked Putut to go find his axe. Putut was happy when he saw the gold, silver, and iron axes. "Grandma, all of the axes are mine," he shouted while pointing towards the axes. "Take all the axes, if all of them are yours." Putut lifted all of the axes and left the old woman without giving any message any further reply. Once he arrived in his hometown, Putut was really surprised as he saw all of the axes transforming into crabs. His body ached because he was clamped by the crabs. He shouted and cried. His back was also covered in blood. Pirit was shocked when heard Putut's screams. "Putut, what' happened to you?" he asked anxiously. "Ouch! You're the one who caused all this," said Putut. "Now look what happened to me," Putut continued. 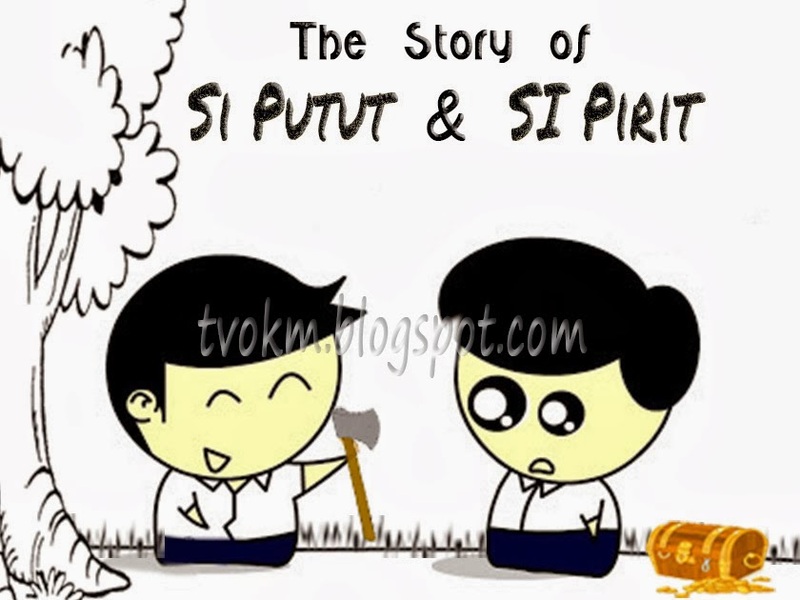 "You did not listen to my entire story," Pirit answered, while helping Putut release the crabs from his body. The honest gets the favorable outcome, while the greedy does not get anything; except a disaster anyway.